June 2009, Taipei, Taiwan-A mobile computing revolution arrives June 2, at the Computex 2009 show in Taipei, where content providers, carriers and consumers get their first look at what may be a whole new category of high performance communication devices. The élan is first in Mobinnova's line of ultra-portable computing devices powered by the NVIDIA® Tegra™ Computer-on-a-Chip. The 2 lb. 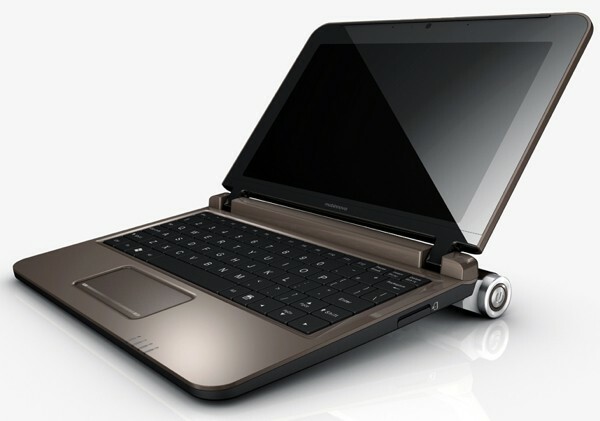 élan is like a netbook in that it's small, has a keyboard, and offers easy access to the Internet. However that's where the similarities end. The élan powers up instantly, connects directly to a 3G wireless network, offers hours of continuous use, full page web browsing, and delivers graphics performance never seen before on a mobile computing device--all packaged in Mobinnova's stylishly thin design. "This truly portable device is a pleasure to hold and to use. It offers 720p high-definition video playback, full Internet browsing and an impressive battery life," says KC Kuo, Chairman and CEO of Mobinnova. "We like to say it 'runs on fun'. It's a real game changer." 5-10 hours of continuous HD video playback on a single charge (dependent on screen usage). Up to 24 days of continuous audio playback on a single charge (if screen not in use while listening to audio). 8.9 inch screen size provides a rich viewing experience and full page web browsing. Ultra-light, compact design at 1.84 lbs (836g), 9.1 inches (232mm) x 7.3 inches (186 mm) x .8 inches (20.5 mm). NVIDIA Tegra-based platform that supports accelerated Adobe® Flash® animations and 720p high-definition video playback. Both Wi-Fi and 3G wireless connectivity, enabling you to check your email, social networking accounts, and do internet searches wherever you are. An innovative 3D graphical user interface. Ability to view Microsoft® Office® and Adobe® documents. A webcam for sharing video. Fast, high resolution photo rendering, upload, and download. Fanless operation for a quite, cool experience. Advanced power management, allowing the élan to draw as little as 50mW during typical operation and 150mW during video playback, a fraction of most devices on the market today. Mobinnova's élan is the first in a family of mobile devices based on the Tegra platform from NVIDIA, the inventor of the GPU. Also being shown at Computex is the Mobinnova T8, which combines the same powerful platform with a 10.1" touch screen, GPS, and HDMI and VGA video output. "Mobinnova has designed several interesting Tegra-based, mobile Internet devices that will surprise the market with their sleek, lightweight design and long battery life," said Mike Rayfield, General Manager Tegra Business at NVIDIA. "Tegra adds the secret sauce to deliver a desktop-like Internet experience and cell phone-like battery life in these new designs." "The Mobinnova élan and T8 answer the portable communications challenge," says Mobinnova's Chairman and CEO, KC Kuo. "We are honored to partner with NVIDIA to create products that make people's lives easier, more productive, and more enjoyable."